The Crest of Alpha Lupi has a particular niche where it will be useful but once in that niche it will shine out as a worthy addition to any Guardians armament. Its exotic perk, Keeper of the Pack is identical to the Hunter version of the Crest of Alpha Lupi and the Warlock helmet, Light Beyond Nemesis. Under the guise of this perk, teammates are revived faster and you are also revived faster. On top of this, any Supers will generate an extra Orb of Light for your allies. This exotic is specialised for a PVE going Titan with the main body of its exotic capability lying with faster revive times. In generic Crucible events, Keeper of the Pack will not see much use, with only the extra orb as a boon from this exotic. In certain PVP events where revives are critical such as Trials of Osiris and Elimination, the Crest of Alpha Lupi will be a worthy addition as the quicker your team can be restored to full strength, the quicker you can rally together and hopefully clutch the win. 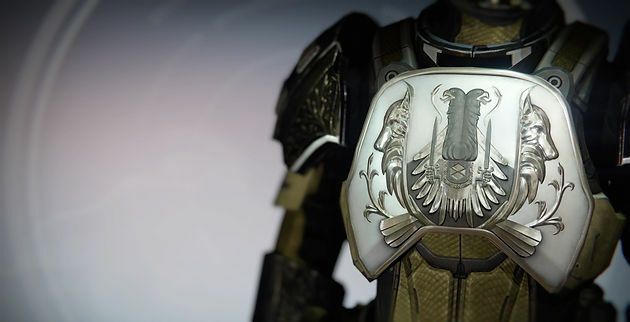 The Titan version of the Crest of Alpha Lupi isn’t as 3D as the Hunter version but it is quite a bit more ornate. The middle of the chestplate we are given two Eagles looking in opposite directions to each other. Within many different mythologies we are presented with animals that occupy high status as top predators, that are associated with the gods of a given culture. Destiny has many connections to Norse mythology and Odin, the father of Thor and king of the Norse pantheon has a strong association with Eagles and Ravens. Similarly in Greek myth, Zeus sent two Eagles in opposite directions, one East and one West and where they met marked the middle of the Earth. This would explain why they are facing opposite directions. Although on the Crest of Alpha Lupi it could just be a design choice. We are then presented with two ornately carved wolves, also facing different directions. This could take a leaf out of Norse myth with it being a depiction of Geri and Freki, the two wolves who accompanied Odin. The chestplate’s design seems to be composed of a valuable metal such as silver or platinum and is placed on a white base, which makes the design standout even more. The Crest of Alpha Lupi can be gained from an exotic chest engram or purchasing it from Xur if you are lucky enough for him to have it in his inventory.